Do you or a golfer you know love BBQing? 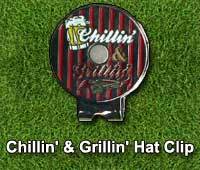 Why not take the BBQ to the golf course with one of our BBQ themed golf ball markers? Did you know May is National Barbecue Month? Get in the BBQ spirit with your own BBQ golf ball markers. Also, June 11 is #CornontheCob day. 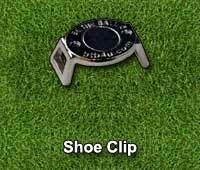 Switch out your BBQ ball marker for the corn on the cob ball marker. Whether it is ribs, a T-Bone steak, a turkey leg or corn on the cob that is your favourite BBQ'd meal we have you covered. 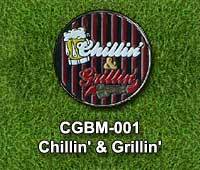 Round Chillin' and Grillin' BBQ grill ball marker. 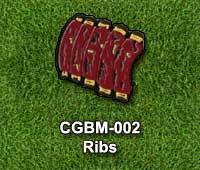 Rack of BBQ ribs shaped ball marker. 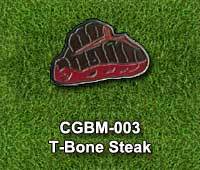 BBQ T-Bone steak shaped ball marker. 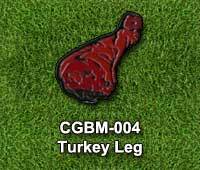 BBQ turkey leg shaped ball marker. 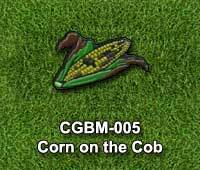 BBQ corn on the cob shaped ball marker. How about some fruit to go with your BBQ? Check out our Swarovski fruit ball markers. Beer goes with BBQing and golfing right? Check out our beer mug ball markers also! Order Your BBQ Ball Marker Now! These items are shipped from the U.S.A. and can be shipped to Canada and the Contiguous U.S.A. via the US Postal system..